I have wanted to make an avocado based chocolate mousse ever since I watched Skye make one on Master Chef Australia Season 2. So when Linda from The Squashed Tomato sent me an invitation on behalf of ZZ2 to participate along with 13 other bloggers in their “More than just guacamole!” Afrikado Blogger Challenge! I knew straight away what I was going to make. 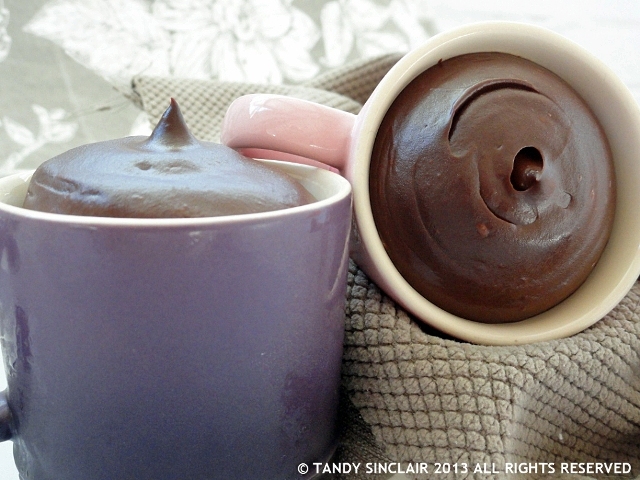 I had no idea what my avocado chocolate mousse would taste like but I wanted to get a silky smooth texture. I have the recipe book from Master Chef which I got when I cooked ‘with’ Alvin Quah and I used Skye’s recipe as inspiration. I did not want chunks of chocolate in my mousse and I knew that I wanted the avocado to feature as a taste without it overpowering or being overpowered by the chocolate. This recipe is packed full of super foods as it uses not only avocados but also raw cacao. It can be part of a raw food diet if you melt the chocolate at the correct temperature, and it can be turned into a vegan recipe if you substitute the honey for agave syrup. No matter which way you look at it, this is a healthy excuse to indulge in dessert. This dessert was given to four people to taste test without being told what the ingredients were. Everyone loved the avocado chocolate mousse, even if they could not identify the ingredients and topped with cream it was fantastic. Disclosure: I will receive a R200 Woolworths shopping voucher for taking part in this challenge. The winning recipe will win a R2000 Woolworths shopping voucher as well as a ZZ2 hamper. This post is in line with my blogging policy. Absolutely awesome! Beautiful picttures, beautiful (and very healthy) recipe! I find the Nomu cocoa is readily avaialable and really quite inexpensive when you consider it’s pure – and when you take the price of the impure cocoas into account…can’t wait to try this one! Oh I’ve wanted try this dish for ages too. The raw egg in normal chocolate mousse stops me, so this would be the perfect alternative. Looks great Tandy. I once joked about putting avocado in everything…and now I can put it in this! I would put it in everything if I could! looks DIVINE!! Yummy, I love the smooth velvet texture you get when using avo. Well done Tandy, I am posting mine tomorrow, was ummming and ahhing about the photo, but I think I have it now! Now that sounds like a really interesting recipe. Hi Tandy. I sure like the sound of this. As soon as the avocados start to ripen I will try it and let you know how it goes. What do you mean by coconut water? Is that the fluid from a fresh coconut or something you buy? Do you buy it in a tin or do I need to buy a coconut? Green coconuts are readily available, is that what you mean? Lovely version, Tandy. I made mine with banana. Love that! I think the banana must add another great flavour to this! Sounds very interesting. I’ve tried some beetroot “chocolate” recipes which were OK, but I couldn’t really see the point. The avocado, on the other hand, has the right texture and the addition of coconut water suggests a really clever recipe. Thank you Roger. I have also used beetroot for baking – I think all it adds is colour – if that! That must have been very sweet indeed! I would like to taste it before making it – although I love avos so should enjoy this too. My first thought was: WHAT avocado and chocolate! But I will definitely try this recipe, maybe add some ground cardamom to it. Good luck with the challenge and a wonderful new week to you! Great to see your recipe. Very different from mine but it looks equally delicious! Will have to try it this way too – I expect it would also freeze nicely to make an ice-cream.